Since Ubuntu 11.10 Oneiric, the typing break has gone away from “System Settings -> Keyboard”. It’s been split out into an app called DrWright. This tutorial shows how to install DrWright and re-enable typing break in Ubuntu 12.04 & 11.10. Drwright got a stable ppa for Ubuntu 12.04 & 11.10, you can use this graphical way adding ppa:drwright/stable and install drwright. Once drwright installed in Ubuntu, head to System Settings -> Typing Break. 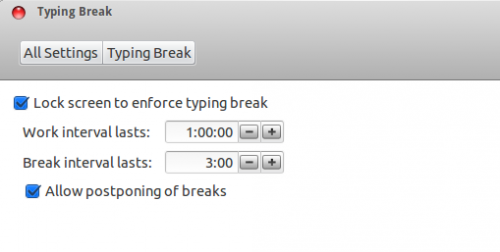 1 user responded in " Get back Typing Break in Ubuntu 12.04 & 11.10 "
It works but the improved version is not so slick as the older version and has annoying beeps when the break is over that I cannot disable having left the machine running and gone to bed. I have to remember to kill the sound output.